We were staying in Goliad, Texas for a few days while we were away on vacation. There is a lot of construction and oil field work occurring in the area, and many of the men stayed in the same hotel where we were. I noticed these boots outside a door a few doors down from our room one night. The next morning, they were still there, so I decided to take a photo. 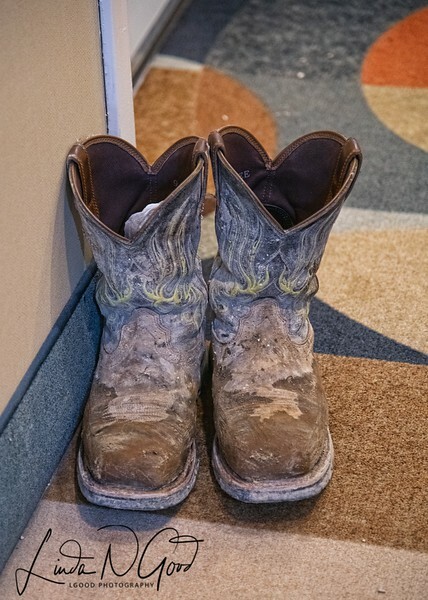 What attracted me to them is first that they were obviously worn by someone that works hard; second was that it was so considerate of the wearer to have left them outside and not tracked mud into the hotel room. Finally, I realized in post that the tops of the boots were shaped like hearts. To me, this is a photo that tells a story, and a story that the viewer can make up themselves based on their own thoughts and experiences. Thank you for your comments and critiques, much appreciated. Have a beautiful day today, and for those trapped in the Polar Express deep freeze, please be safe and stay warm. Well seen and captured. A timeless still life with wonderful texture and detail. Very interesting find and thoughtful comments on your part !! Thanks Rick, John, Kevin, Greg&Rose and Judith.